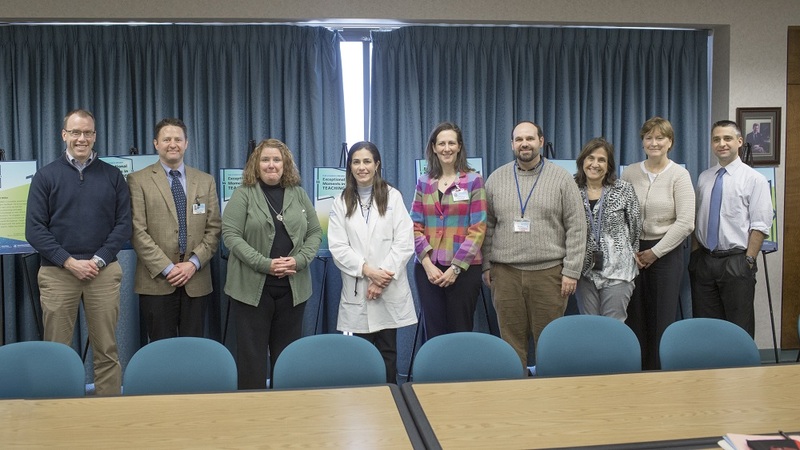 Exceptional Moments in Teaching winners, from left, Dr. Matt Silvis, Dr. Laurie Nelson, Dr. Emmanuelle Williams, Dr. Karen Krok, Dr. Michael Freeman, Dr. Debra Byler, Dr. Pamela Brian and Dr. Jed Gonzalo. Dr. Matthew Silvis, a sports medicine physician in the Department of Family and Community Medicine at Penn State Health Medical Group — Palmyra, received the recognition in April 2018. “He took time out of his week to put on a review session for us at night, which he wasn’t required to do,” said his student nominator. Dr. Emmanuelle Williams, a gastroenterologist at the Milton S. Hershey Medical Center, “created a safe space for us to make mistakes and learn from them,” said a student. Williams was recognized in February 2018. Sometimes they’re small. Sometimes they’re grand gestures. But teacher-student moments like these are important strands in the fabric of an education at the College of Medicine. And they happen more often than you might think. During the past 17 months, George Blackall, director of the Office for a Respectful Learning Environment, has collected 758 narratives from College of Medicine students hoping to recognize someone who both challenged and changed them. The program, Blackall says, is helping to make the College of Medicine an even better place for tomorrow’s medical professionals. The narratives came from 37 departments, recognizing 302 people. Of those recognized, 214 were faculty members and 68 were residents. The group also included nine fellows, seven nurses and four graduate students. “This program is starting to garner some national attention,” Blackall said Wednesday at a luncheon honoring the recipients of the monthly award. An upcoming edition of Academic Medicine will publish an article about the Exceptional Teacher program – the Office for a Respectful Learning Environment’s overall effort to gather narratives about outstanding teachers. It began in late 2016. The Association of American Medical Colleges’ annual survey showed that the College of Medicine ranked slightly above the national average in student complaints of mistreatment. The College of Medicine created the Office for a Respectful Learning Environment to turn the numbers around. In addition to addressing problems, Blackall discovered focusing on positive moments could help improve the environment. What followed was the Exceptional Moments in Teaching Program. And now, according to the association’s most recent survey, the mistreatment number has fallen by 10 percent.